Before and after photo, East Harlem, New York City. New York Daily News photos. 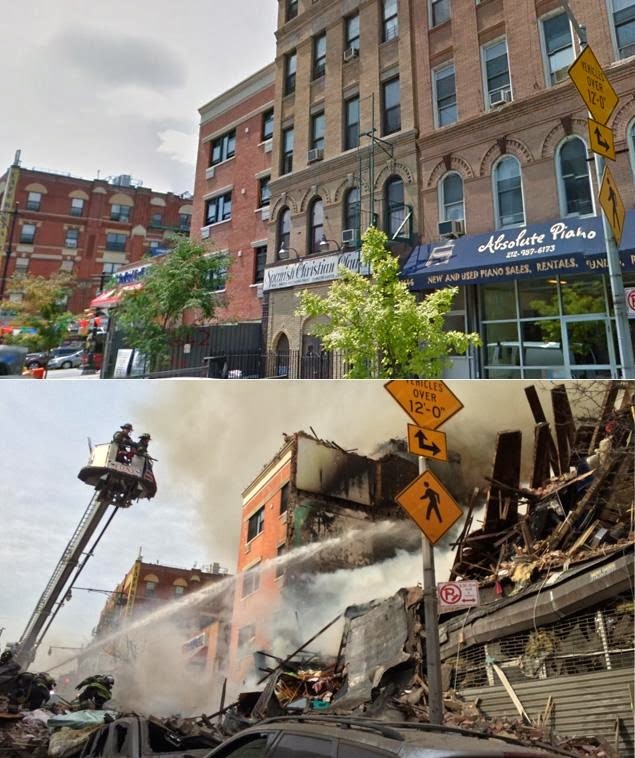 ... as the gas leak induced explosion yesterday in Harlem, which killed at least six people, injured dozens, and destroyed two 5-story apartment buildings communicates to us. See "Deadly building explosion puts focus on NYC's aging infrastructure" from the Christian Science Monitor and "Water main collapsing onto gas line causes explosion in East Harlem that kills 6, injures dozens — up to 9 people feared missing: sources" from the New York Daily News. Ironically, the day before the explosion the Center for an Urban Future released a report, Caution Ahead: Overdue Investments For New York’s Aging Infrastructure, on this very topic, which mentioned that the city’s 6,300 miles of gas mains are more than 50 years and a majority are constructed of piping which is not leakproof. Not even considering recent catastrophes in West Virginia and North Carolina with regard to chemical contamination of water supplies, drinking water distribution has aging infrastructure issues as well, with frequent catastrophic breaks, and consistent unfixed leaks, as well as constantly upping of regulatory requirements for storm and sanitary sewerage systems. See "Saving US Water and Sewer Systems Would Be Costly" from the New York Times. The article quotes DC Councilmember Jim Graham suggesting that somehow this infrastructure can be "reformed" without having to increase rates to cover the cost of the upgrade. In the DC region, frequent breakdowns in the electric utility infrastructure have spurred calls for changes to the distribution network (e.g., "Work to start this year on burying key DC power lines," Post) and in Montgomery County, one legislator, Roger Berliner, has suggested that the county take over the power distribution infrastructure and set higher maintenance standards (see the past blog entry "Press piling on Montgomery County's utility dreams"). Of course, the impact of Superstorm Sandy in 2012 on electric distribution infrastructure and siting and equipment issues in buildings and for the transit system (which runs on electricity) in New York City and New Jersey especially was another notification about the need for serious upgrading of utility infrastructure. As the developer Jonathan Rose said (paraphrased) at a conference, "When Superstorm Sandy hit Wall Street, they no longer denied the existence of global warming." 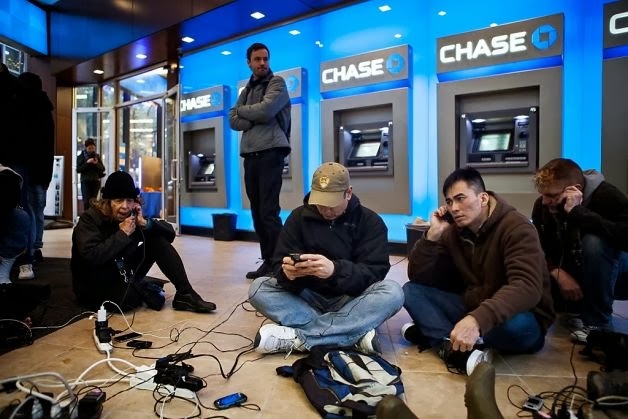 Post-Superstorm Sandy, Lower Manhattan without power. Photo by Iwan Baan, for New York Magazine. The National Journal has an article, "Your Utility Bill Is Going Up (and There's Nothing You Can Do About It)," about how the utility regulatory process isn't structured to support community input, mentioning Abbe Millstein, who has created a consumer group powerupmontco, to weigh in on electric utility distribution issues in nearby Montgomery County, Maryland. She is particularly worked up over electric rate surcharges for upgrading utility infrastructure. (But the group doesn't have a website, so how does one obtain copies of the "50-page booklet for state Assembly members and candidates" that they produced about the issues. While I understand the sentiment, especially because utility companies don't do a good job communicating with the public, and they do overstate the costs of construction (for example, in DC Pepco's pricing for undergrounding electric lines in commercial districts is more than 15 times that national average as reported by the Edison Electric Institute, a trade group), I don't see how we can avoid paying the necessary costs for upgrading utility infrastructure, although I agree that how to bring disconnected utility companies and their officials to bear is definitely an issue. The alternative, limited access to electricity and natural gas, is unthinkable. Not to take away your point, but one of the buildings just had gas installed last summer. I suspect that might be the cause, rather than the aging infrastructure. Are there are best practices in terms of burying verizon and phone lines in alleys? Stange blackout in DC last night --- even with the underground wiring. 2. we had light flickers here and there, but no blackouts, and we're in the overhead wire section of the city. 3. I've actually wondered for sometime why phone lines aren't buried also in the core? They were in my suburban subdivision back in high school days. 4. Branson's like Trump, but a lot smarter and likely a better businessman. Certainly more of a risk taker. Thanks!